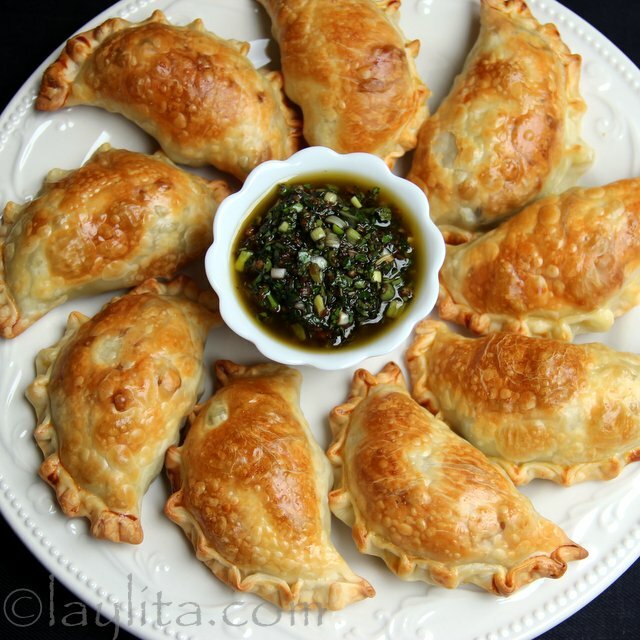 It’s time for a new empanada recipe! 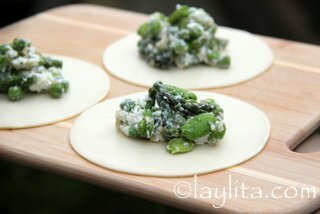 This time I prepared asparagus empanadas that are filled with asparagus, fava beans, fresh peas, goat cheese and thyme. 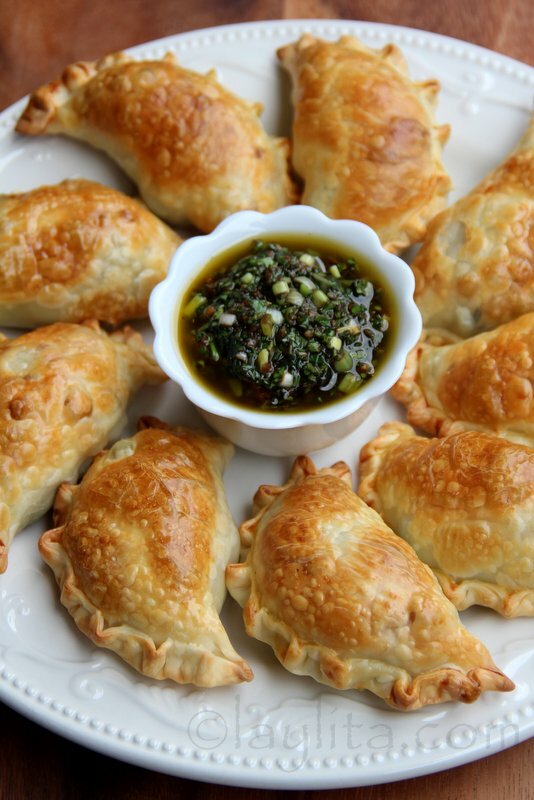 These vegetarian empanadas are a great way to celebrate spring and early summer vegetables. I find that empanadas are a great way to use seasonal ingredients. Farmers’ market season is just starting here in the PNW (this is luckily also coinciding with some great weather). 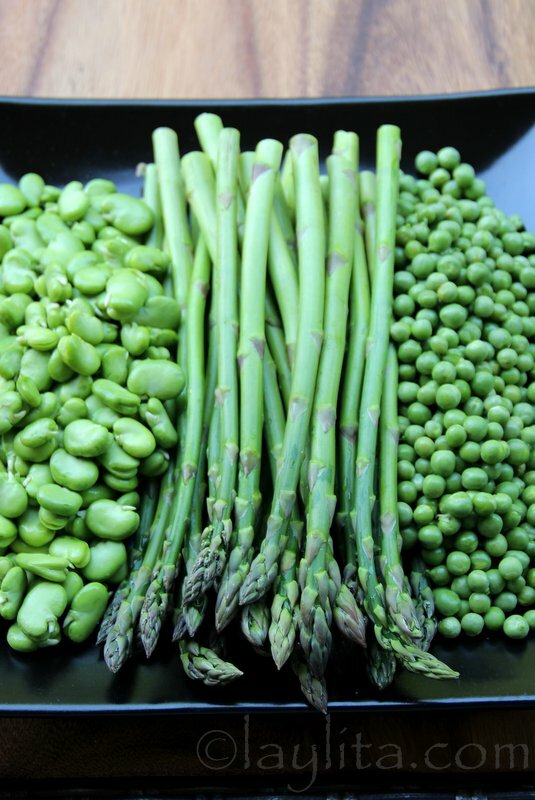 I love going to the market and filling my basket with delicious and fresh veggies and fruits. 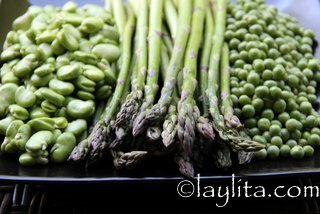 I usually don’t have a pre-set plan about what I’m going to cook and just let the fresh ingredients be my inspiration. 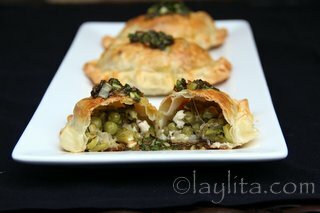 Asparagus empanadas filled with asparagus, fava beans, fresh peas, goat cheese and thyme. 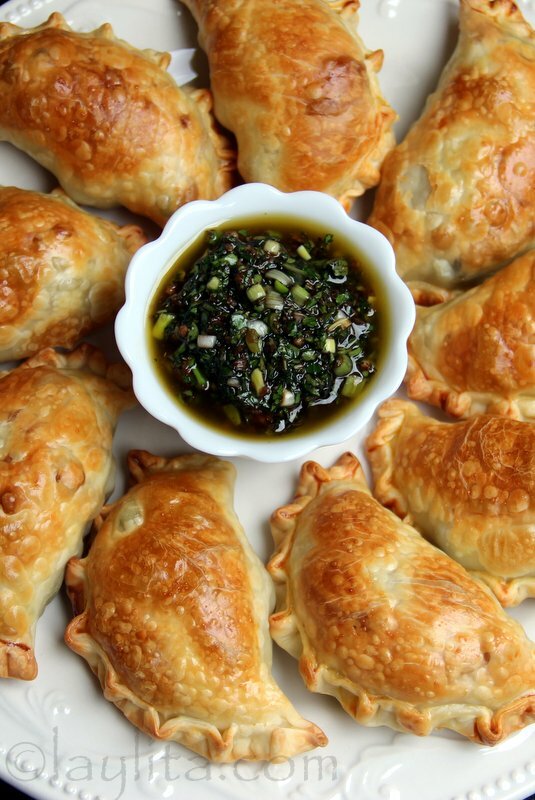 Serve the empanadas with a balsamic chimichurri sauce. 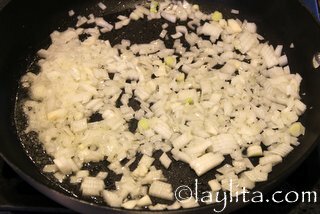 Melt the butter over medium heat, add the diced onions and cook for about 5 minutes or until soft and translucent. 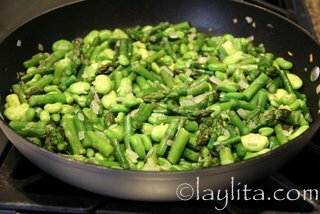 Add the asparagus and cook for about 5 minutes. 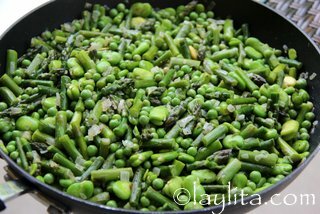 Add the fava beans and cook for about 3 minutes. 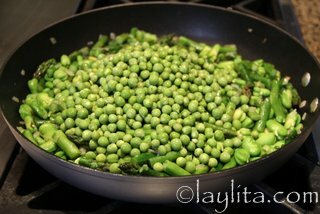 Add the peas and cook for another 3-5 minutes. Add salt and pepper to taste. 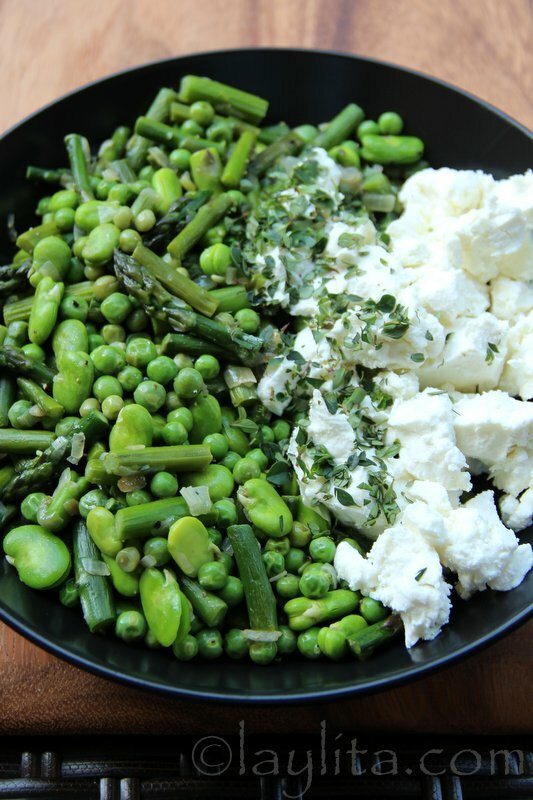 Let the vegetables cool down slightly. 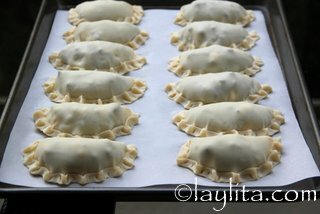 Mix the vegetables with goat cheese and fresh thyme, save the filling until ready to assemble the empanadas. 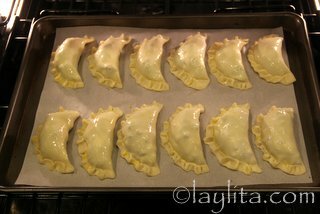 To assemble the empanadas, place a spoonful of the asparagus, fava bean, peas and goat cheese mix on the center of each empanada disc. Fold the empanada discs and seal the edges. You can either use a fork to help seal the empanadas, or use your fingers to twist and curl the edges or to make a repulgue or curled seal for the empanadas. 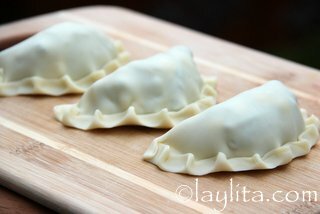 If you have time, chill the empanadas for at least 30 minutes, this will help them seal better and prevent leaks. 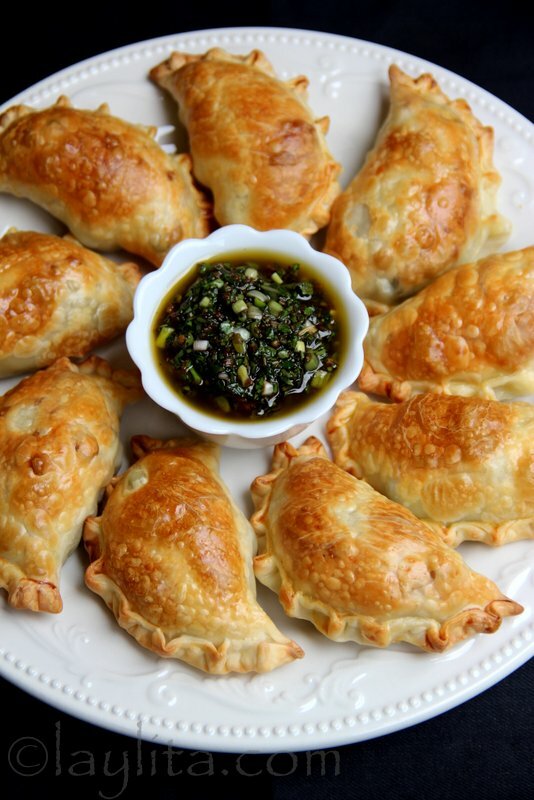 Serve the empanadas with the balsamic chimichurri sauce. 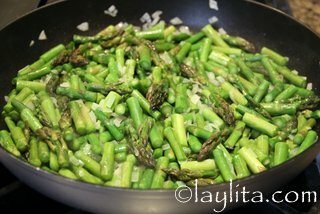 I love asparagus. 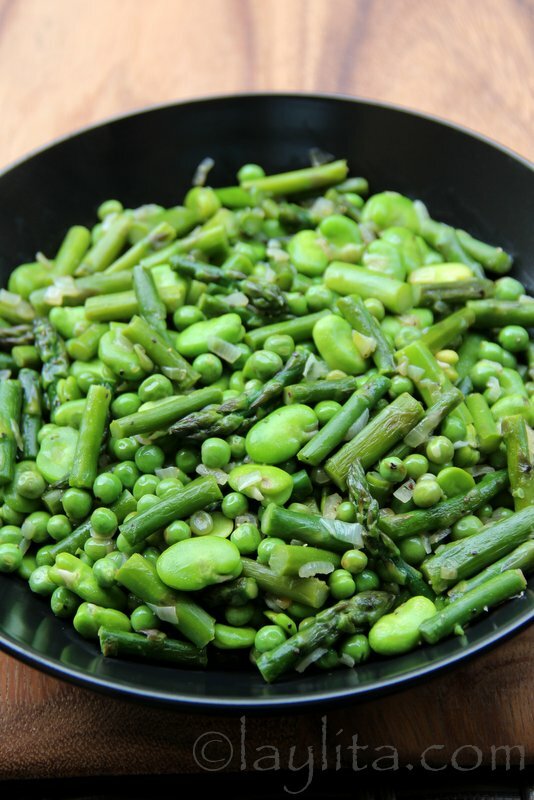 I love fava beans – known as habas in Ecuador and usually available year-round there, so I’ve really learned to appreciate them in the US since they are much more seasonal. I love fresh peas; it’s very common to see ladies with baskets filled with bags of fresh shelled peas on the streets in Ecuador. And of course, I love goat cheese. 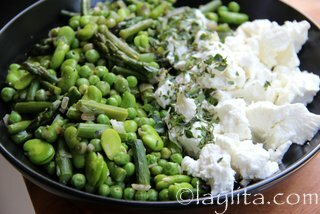 This goat cheese and asparagus empanada filling on its own is delicious and can easily be a great side dish or a topping for crostini or toast. 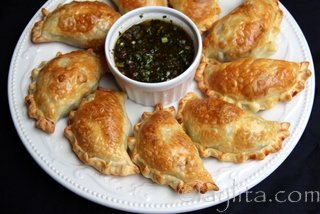 As usual, I highly recommend serving these asparagus empanadas with a dipping sauce, I personally love the balsamic chimichurri sauce – it goes great with the vegetable and goat cheese filling. For the empanada dough, you can either make your own at home, or buy the frozen empanada discs at your local Latin grocery store. Hi Maggie – Yes, they can. 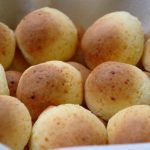 They have some that are specifically only for frying, others that are for baking, and some that are for either frying or baking. If they say “para hornear” it means they are for baking (and “para freir” means for frying). Wow! 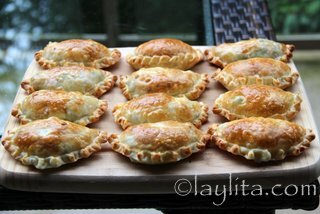 Just got back from Ecuador trip where I fell in love with empanadas. No one city or restaurant had them alike. Anxious to try yours. Also fell in love with something that looked ( sort of) like a hush puppy and was very orange in color. We loved it…it was fried with a crispy outside and sweet tender inside. I think it was made with cornmeal. Help me! When we asked at restaurant the only thing we could translate about it was sugar. Can you help me figure this out? 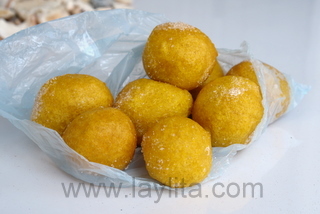 Hi Kim – It sound like those might be huevitos chilenos, did they look like this: https://www.laylita.com/recipes/wp-content/uploads/2011/11/Desserts-Huevito-chilenos.jpg ? 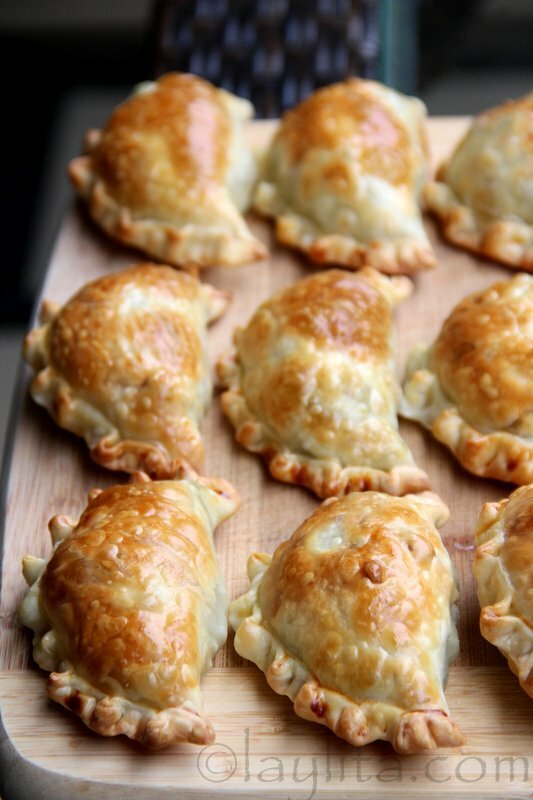 What a beautiful post and what delicious empanadas…A must for me real soon. Laylita! 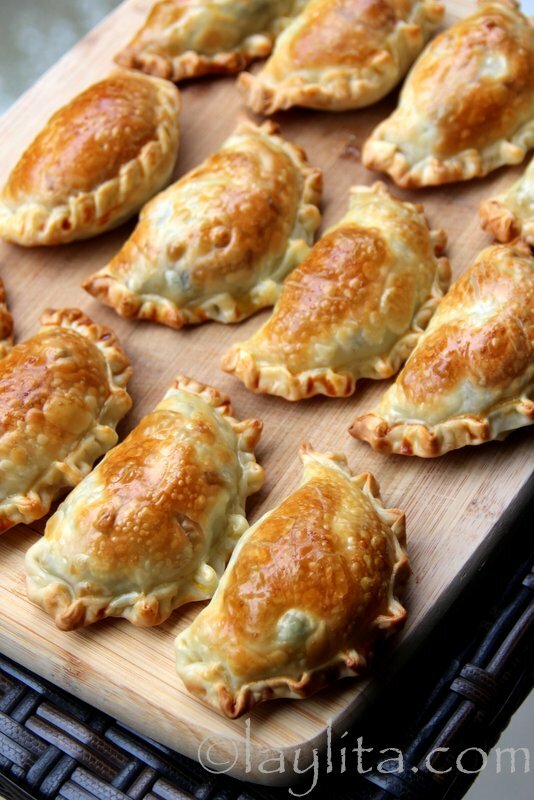 these empanadas look amazing! thank you for your recipes, your imagination and the amazing pictures, is a pleasure to look at your recipes. I have made quite a few of your recipes and they are always a hit! thank you! 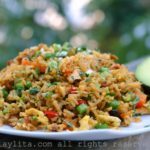 Dear Laylita, your Ecuadorean recipes bring sweet memories of my dear Ecuador, I had try many of them, then compare with my sisters, what our dear mother used to add or not to the recipes. Believe me both my mother and you are the best Ecuadorian ambassadors . Dear Carmen – I’m completely flattered by your sweet comment! Thank you!